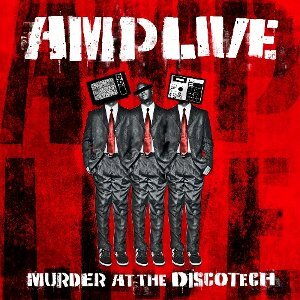 Amp Live’s solo debut Murder at the Discotech drops March 16 on Child’s Play/Om Records. Sure, the Zion-I producer has dropped plenty of mashup mixtapes before — most notoriously the Radiohead mashup Rainydayz Remixes — but this is the first official collection of original material. The anticipated electronic and hip hop fused record features guest vocals by Mickey Factz, Zumbi of Zion I, Grouch, Eligh, Trackademicks, Fashawn, Myka Nyne, Hot Tub, Yak Ballz, My First Earthquake, Golda Supa Nova, Bambu, Dude Royal and more. Featuring the internet buzz hits ‘Gary is a Robot’ featuring Trackademicks (Fools Gold) & Mr. Micro and ‘Turn it Up’ featuring Mickey Factz (XXL hottest mcs to watch out for 2010), Murder at the Discotech is best defined as electro hop; melting dubstep, electro, hip hop and indy in to one pot. This entry was posted in News and tagged Amplive, Child's Play. Bookmark the permalink.